Bridge and Aft Enclosure in Sunbrella(TM) and StrataGlass(TM). Please feel free to browse our Blog site using the search bar/box... try the search tags "canvas" or "upholstery" for example and click search. All images you will find here are guaranteed authentic and reflect the work which we have done so far. Please be advised that we do not post photos on this blog site on a frequent basis due to the lack of time for website administration. Thank you! Please be aware that we are working on job-site (within 65 kilometres of our shop) at times and the workshop will state "closed". Please contact us via phone or eMail and we will be glad to assist you with any inquiries. Q: How to get a Quote on my project? A: If it is possible to bring your project in/by we will take measurements and photographs (sometimes it is enough for you to provide pictures and basic measurements) and write a Quotation accordingly. We are also able to meet costumers at their preferred location if it is within range of our workshop. Q: Will you accept projects in Vancouver? A: We will gladly accept projects that are no further than Granville Island (around Burrard) e.g. : no further than Lionsbay Marina when going towards Whistler and no further than Quayside Marina / Edgewater Casino. This applies to projects that can not be relocated due to cost and time-intense logistics. Q: Do you sell foam? A: We do sell foam that is custom-cut/shaped to customer request. We are also able to get you costum mattress with custom-core. Foam comes in different types (densities and textures). Please feel free to come in and have a look at the different foam types we offer. Also please keep in mind that any Foam order will include shipping costs as we do NOT stock foam products (costumer request ONLY). Q: Do you sell fabric/canvas? A: Of course we do, minimum quantity is one yard for every type of fabric. Shipping costs will be applied. Please feel free to walk in and browse our sample books. Q: Can I get you to copy my existing Canvas or Frame? A: We will do so at your own risk. It is standard for us todo costume fitting/templates/patterns to avoid mismatch or a product that will not fit to wherever it gets applied to. Materials that have been stretched or shrunk over the years make terrible templates. FRAMES however can not be copied since we will NOT be able to get the exact bending radius or crowning sequence. Our bending equipment supports the standard for canvas-top/cover frames. 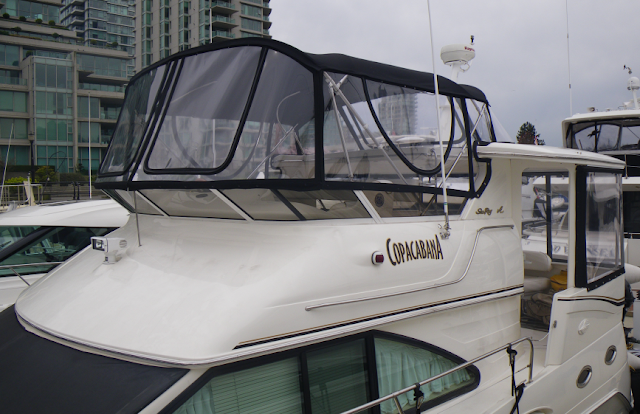 Any canvas is pretty much custom made that bares for frames, attachment points (fasteners or awning rails) and boat type. Believe it or not but you will NEVER find a boat of the same type using the same fasteners, angles or spacings even if it is the same year. Q: Do you make custom stainless steel frames for boats? A: Yes, except for railings and frames other than such which hold Canvas-Coverings in place. Q: How long will my new canvas last for? A: It is entirely up to you how well you take care of your canvas to make it last. We have seen canvas-work that survived for almost 20 years (that does not apply for vinyl tops! Vinyl tops don't last no matter what you do to them, unless it is automotive grade.) and we have also seen canvas-work that didn't survive their way back home taking the highway going 100 km/h (don't trailer your boat going over 80 km/h, we can't stress it enough) resulting in doubled stitched(!) zippers separating. In a nutshell avoid heavy wind-force, use the proper cleaning cycle and substances and take your canvas down / store it somewhere protected from harsh weather, and you will enjoy a long lasting Canvas. In Canada registered and legally operating Business. Photographs on this website are 100% authentic and represent our work.